Travis County STAR Flight, in Austin, Texas, is recognized as one of the premier public-safety helicopter programs in the United States. 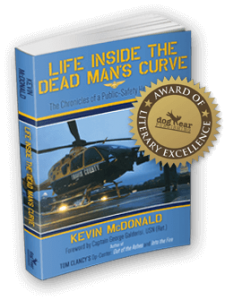 Life Inside the Dead Man’s Curve is a firsthand account of the tragedy and triumph witnessed by STAR Flight crews as they respond to a myriad of emergencies, everything from traumatic injuries to rescues and more. Having received a journalism degree from the University of Texas at Austin, Kevin McDonald was commissioned into the United States Navy as an ensign in 1982. Two years later, he graduated at the top of his Navy flight school class and spent the next eight years flying as a naval aviator, logging most of his time in helicopters. In 1992, during the drawdown that followed the First Gulf War, he left the Navy and became a public-safety pilot for Travis County STAR Flight in Austin, Texas.